Heralding the official opening of the major league baseball season on March 28th, the earliest opening day in history, the NYC Department of Records & Information Services announces the sale of unique baseball artifacts and historical photographs from the Municipal Archives collection. Highlights include reproductions of original architectural drawings of Brooklyn’s Ebbets Field, and photographs of bygone champions such as Joe DiMaggio and Babe Ruth. Cedar Place Elevation, Brooklyn Base Ball Club [Ebbets Field], 1912. Architect: Clarence R. Van Buskirk. Order images of Ebbets Field. Ebbets Field had been the home of the Brooklyn Dodgers baseball team until their abrupt departure to Los Angeles in 1957. Now the site of a housing development, the storied stadium lives on in the memories of its fans. Quality 16” x 20” digital prints of architectural drawings of the stadium on high-quality paper are remarkable mementos of the period. The price is $120.00, plus S&H. The sale also includes 8” x 10” digital prints of historical photographs at a cost of $45.00, plus S&H. Babe Ruth shakes the hand of actor Gary Cooper (playing the part of Lou Gehrig) during filming of the movie “Pride of the Yankees” in 1942. The scene is a recreation of “Gehrig Appreciation Day” on July 4, 1939 when Gehrig retired due to his diagnosis with ALS. Order FHL_0081. 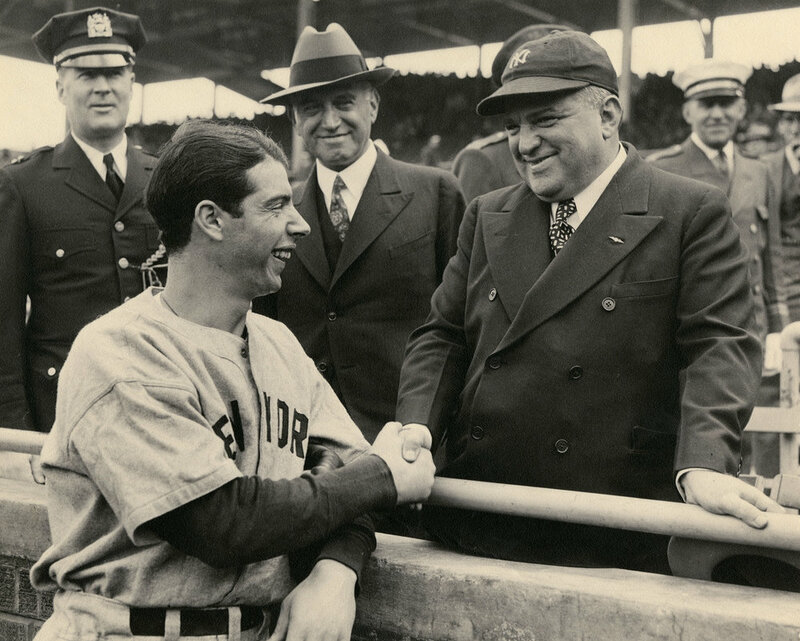 Joe DiMaggio shakes hands with Mayor Fiorello H. LaGuardia, before the start of the 1938 World Series at Wrigley Field. Order Now. Babe Ruth and his wife Claire with singer Kate Smith, in the grandstand of the Polo Grounds, during the New York Yankees/Brooklyn Dodgers World Series, September 1936. Order WPA_0626a. Visit our online gallery to browse more baseball images. 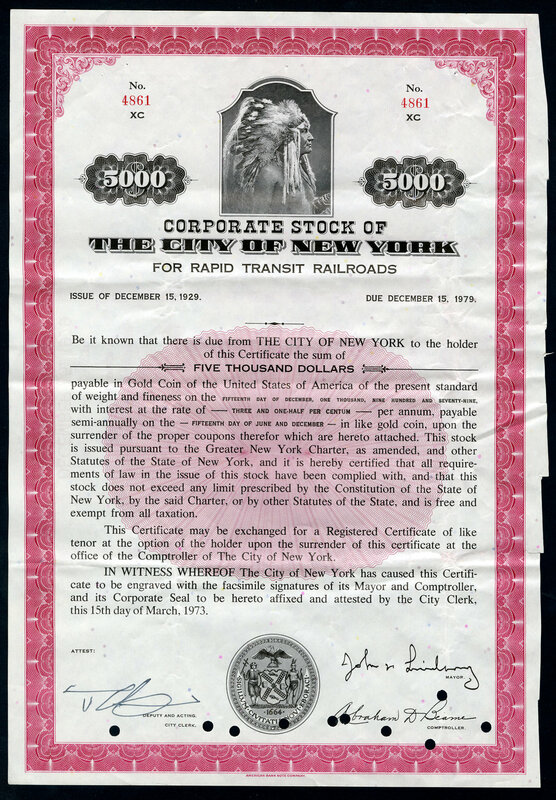 A limited number of original redeemed vintage bonds and stock certificates dating from the 1920s to the 1980s are being offered for sale by the NYC Department of Records and Information Services. Beautifully illustrated and signed by Mayors such as James Walker, Fiorello La Guardia, John Lindsay, and Abraham Beame, they are desirable for both their historical significance and as unique artifacts. They had been originally issued by the City to fund school construction, transit projects, improvements to the water supply, and other municipal purposes. Bonds can be mailed or picked up in person during normal business hours.